I am so excited to share my Sparkly Santa Sign with you today! I’ve kind of skipped over the fall crafts this year hoping nobody would notice (don’t pelt me with produce, please!!) because I am SO HAPPY that it is almost Christmas Season! This is my favorite time of year. I love the decorations, the snow, the carols, the trees and twinkle lights- I can’t think of anything more magical. 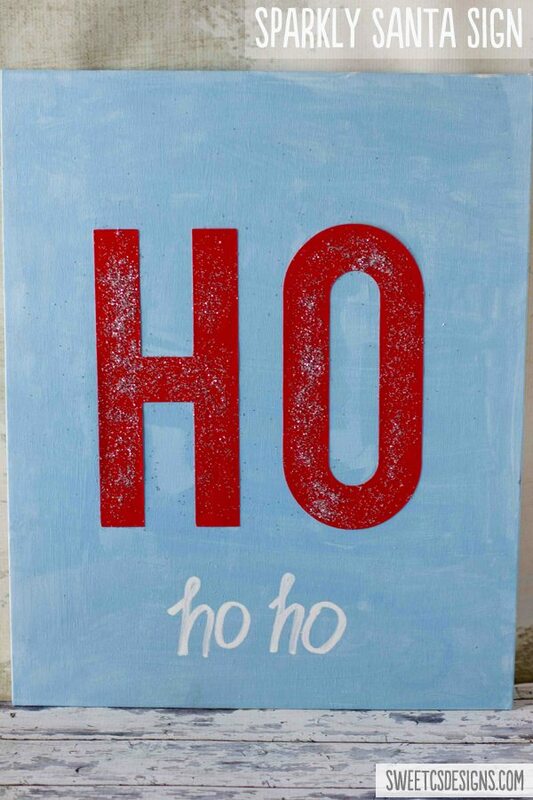 To get myself in the mood, I’ve been making a few signs and wood plank art displays to help celebrate, and I wanted to share this super easy and cute Ho Ho Ho sign with you today! First off, you’ll paint your canvas blue and set aside to dry. Using a cricut or other die cutter, cut out a huge “H” and “O”- or you could print them out on printer paper and layer over your red construction or scrapbook paper and use as a template to cut the letters. When your letters are cut, apply a generous layer of mod podge to the front of the letters and sprinkle glitter over the top. I wanted a slightly glittered look- not completely glittered- so I had a light touch when applying. Next, you’ll apply mod podge to the back of the letters and adhere them to the canvas. Finish up with a final coat of mod podge over the letters to seal them and keep extra glitter from falling. 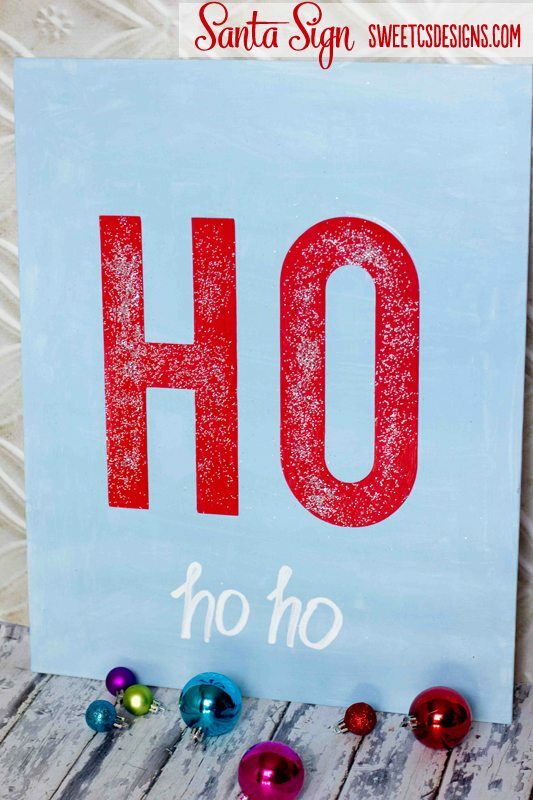 Let dry, then with a chalk pen, draw “ho ho”. There you have it… a beautiful Sparkly Santa Sign to bring some extra holly jolly cheer to your home! What are your favorite Christmas quick crafts? Ahh this sign is too darn cute! I’m loving the sparkly sign. I’ve been making a lot of signs lately, too!